If it is your first purchase of SFP transceivers, you may be very confused with the fuction options “DDM”, “DOM” or “RGD”. So, what functons do they represent? And do you need these functions? Today, we will have a detailed explanation of them. DDM, namely Digital Diagnostics Monitoring, is a technology used in SFP transceivers in order to give the end user the ability to monitor real-time parameters of the SFPs. Such parameters include optical output power, optical input power, temperature, laser bias current, and transceiver supply voltage etc. DOM, short for Digital optical monitoring, is familiar with the DDM function. It is also a feature which allows you to monitor many parameters of the transceiver module in real-time. DOM allows you to monitor the TX (transmit) and RX (receive) of the module, as well as input/output power, temperature, and voltage. Network administrators can then check and ensure that the module is functioning correctly. Author Note: Obviously a SFP with DDM/DOM funstion is high-ender than one which without it. This is why most of modern optical SFP transceivers support DDM/DOM functions according to the industry-standard SFF-8472. You may be confused with the difference with the SFPs with “RGD” and the one without it, or you may be interested in the “-RGD” in the product number of some SFP transceiver modules. So, what does RGD stand for? RGD means rugged transceivers. In fact, these are enhanced transceiver modules which have been designed for greater durability, and can operate under more extreme conditions. Rugged transceivers may feature enhanced ESD protection, and extended operating temperature range so that it can help eliminate field failures without the need of costly external protection devices. Author Note: In general, a rugged SFP can be identified by its product model, ie. -RGD. Specific situations depend on the specific vendors. If you have an experience of buying Cisco SFPs, you may be confused with the part number with “=”, because you can not find out the difference with the one without “=” according to the specification. In fact, “=” is also called a “FRU” part where FRU stands for “Field Replaceable Units”. Those are the parts that can be used as “spare” or be shipped individually to replace damaged units. But the new parts that are ordered directly from a reseller or from Cisco usually don’t come with the = sign. Thus, if you want to buy an SFP transceiver with the “FRU” part, you should ask your vendor to ensure this function. 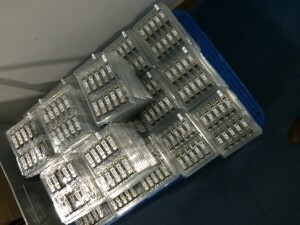 Cisco SFP, SFP Transceiver AGM731F, Cisco SFP transceivers, EX-SFP-1GE-SX, FTLF1318P3BTL, GLC-LX-SM-RGD, GLC-SX-MMD, SFP transceivers. permalink.